The mathematical representation of sound, as it is produced by wind instruments, is defined through using a simple formula. A wind player demonstrates that the sounds of woodwinds and brass instruments are not produced by just simply blowing into a horn. But if the instrument does not have any strings, where does the vibration come from? •Discover how the concepts of proportion and ratio apply to instruments without strings. •Discover how instruments that do not have strings produce sound. 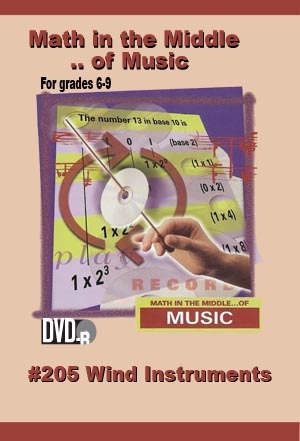 •Learn how sounds are mathematically made by using proportions and ratios.